Students, parents, municipal police and local officials from across Pennsylvania are urged to join schools and community leaders from around the state, the nation and the world to celebrate Walk to School Day on Wednesday, October 3. Held each year on the first Wednesday of October, Walk to School Day is an internationally recognized day to celebrate the benefits of walking by encouraging schoolchildren to walk and bicycle to school. Now in its 16th year in the United States, the event is recognized as a way to bring school officials, local leaders, parents, and children together to build awareness of why communities should be more walkable. In Pennsylvania, the event is promoted as Walk or Roll to School Day. This year, hundreds of elementary and middle school students across the commonwealth are expected to participate in Walk or Roll to School Day. Although events will vary from school to school, they all center on the effort to draw attention to the need for safer routes for walking and bicycling by emphasizing how these activities increase physical activity among children, reduce traffic congestion and air pollution, and build connections among families, schools, and the broader community. Some schools plan to hold a community-wide celebration attended by local dignitaries and school officials and complete with speeches and music; others will simply encourage children and parents to meet and walk to school together. 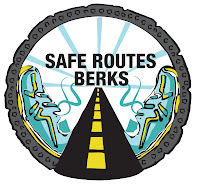 WalkBikeBerks, in partnership with the Berks County Intermediate provide FREE ACT 48 professional development trainings to teachers of grades K-8. To register for the upcoming Bicycle Education Training, visit: https://www.mylearningplan.com/webreg/catalog.asp?H=1&D=13543. “The hope is that Walk or Roll to School Day will generate enough enthusiasm for walking and bicycling that schoolchildren will continue to walk and bike to school long after the October 3 celebration has ended,” says Chris Metka, Pennsylvania’s Safe Routes to School coordinator. Walk or Roll to School Day is promoted statewide by the Pennsylvania Safe Routes to School Resource Center on behalf of the Pennsylvania Department of Transportation and is part of the Safe Routes to School program, a statewide and national effort to promote and encourage safer routes to school. For more information, contact the center at www.saferoutespa.org, info@saferoutesppa.org, or (717) 763-0930 (ask for Safe Routes).